Oh, hey, if you’re wondering where the Estelle/Arthur Z (or, more accurately, Estelle/team of catfishers hanging out in a Kuala Lumpur cybercafe operating the “Arthur Z” SilverDaters account) is at, it’s reached “quoting e e cummings over the phone,” and Estelle is over the moon! The main question I have is if they’ve somehow tricked her into calling into a phone number she has to pay them for, or if they’re doing this toll-free via Skype or whatever and they’re keeping their powder dry for the moment when “Arthur Z” loses his wallet and needs a five-figure sum wired to a Malaysian Western Union office, stat. 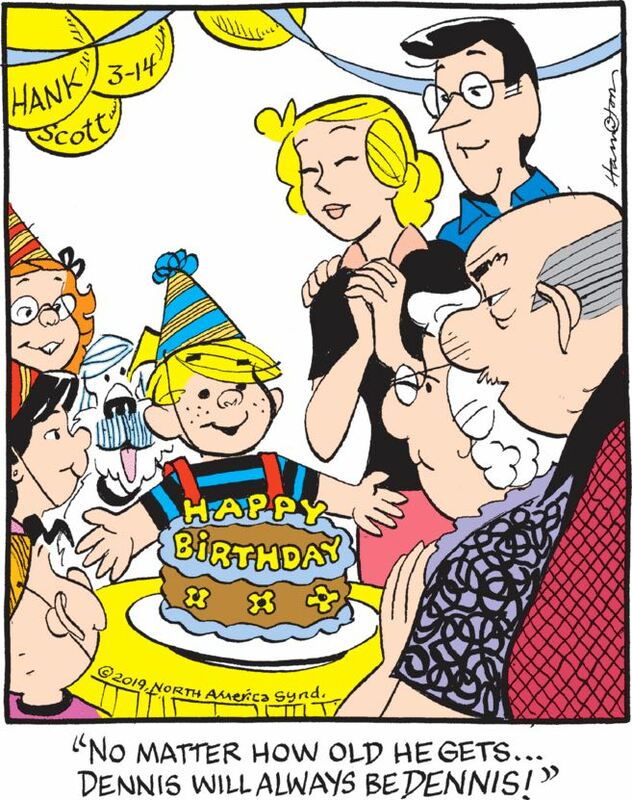 Meanwhile, in Mark Trail, Cherry’s dad just got a phone call letting him know his old friend died, which means we have six to fifteen weeks of a “Doc confronts his own mortality!” adventure ahead of us. Not sure how they’re going to work Mark blowing up a boat into this but I’m confident they’ll find a way. The Wikipedia list of Beetle Bailey supporting characters is invaluable to a scholar of the Walker-Browne Amalgamated Humor Industries LLC oeuvre such as myself, but I have problems with some of its takes on the players’ personalities. For instance, Dr. Bonkus (NO REALLY HIS NAME IS “DR. BONKUS”) is described as “Camp Swampy’s loopy staff psychiatrist, whose own sanity is questionable,” but in all the time I’ve been reading the strip he’s never been anything other than a long-suffering straight man to everyone else’s antics. I kind of enjoy the fact that today’s strip takes place in two entirely different locations; it would have been a little shticky if Rocky had pulled out his guitar and delivered this punchline in mid-session, but as it is we can imagine that he just said “Great!” and got off the couch and left without further explanation, leaving Dr. Bonkus behind to sigh heavily and contemplate, not for the first time, just how much he really helps his patients. Congrats to Six Chix for taking its weird foot thing to the next level … indeed, to the highest possible level. Who wouldn’t want to worship a God with such magnificent toes? Truly we are blessed to be formed in His image, foot-wise. Ha ha, did you guys know that bears are carnivores and kangaroos are herbivores? 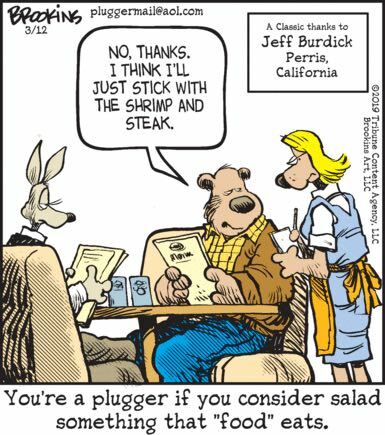 I sure hope plugger diner seats are pleather or some other material that’s easy to hose the blood and viscera off of!